Pottery is one of humanity’s oldest art forms, and the perfection of its techniques has been thousands of years in the making. 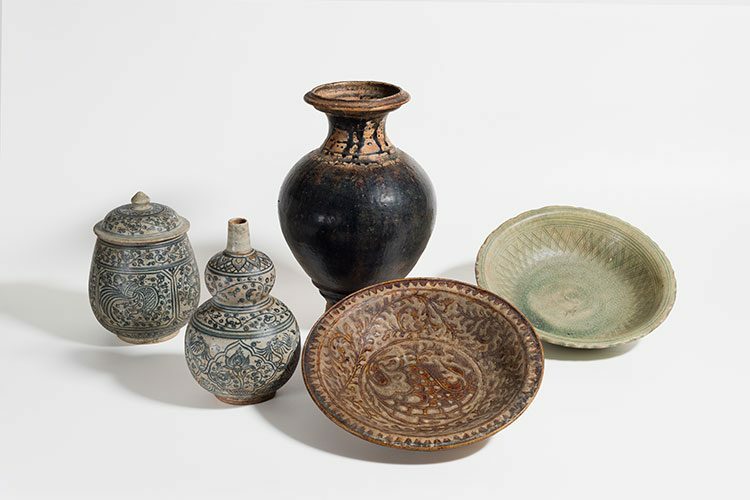 The exhibition Earth to Fire: Pottery Technologies Around the World, currently on display in the Longyear Museum of Anthropology, sheds light on the various technologies and tactics used by potters from different regions and cultures across the globe. The exhibition is divided into four sections, each focusing on a different step in the process of creating pottery. Each of the four steps — material selection, forming of clay, surface treatment, and firing — is represented by one or two regions around the world. For example, the exhibition shows how South African Zulu communities shape pottery vessels and how Peru’s Sican and Chimu cultures used reduction firing to achieve a rich black finish. Student curatorial assistants Sierra Sunshine ’17 (Old Lyme, Conn.), Cameron Pauly ’19 (Bothell, Wash.), and Carrie Zhang ’20 (Suzhou Jiangsu, China) helped plan the exhibition. Each student focused on a different region, conducting research and updating information on museum objects. They also wrote labels and designed their sections. Some anthropology classes have already visited the exhibition, and DeLair works with professors to bring relevant objects into their classrooms. Local K-12 schools are also planning trips to the Longyear Museum this spring. The Longyear Museum of Anthropology was established in the 1950s by John Longyear, an archaeology and anthropology professor at Colgate. The museum was named after Professor Longyear when he retired in 1978 and remodeled at its current home on the second floor of Alumni Hall in 1985. Today, the Longyear Museum’s collections include more than 20,000 archaeological, ethnological, and contemporary art objects from Africa, Asia, Oceania, Europe, and North and South America. Earth to Fire: Pottery Technologies Around the World will run from January 31 to June 4. Admission is free and open to the public.